Marriage is hard. Marriage is difficult. As women we don't always understand men, especially our husbands. I have had many, many difficult times in my marriage with Mr. Q. I have had so many things to learn and so much growing to do. Many times the growing has been painful, as it seems I have had to learn things so quickly that I wasn't ready for them. I have had to try to be a different kind of wife than what I saw growing up, as my husband just would not tolerate some of the things I witnessed my own mom do. Many things I am still learning and adjusting to. Ideally, we all have a wonderful example in our mothers growing up. A wife who honors, respects, and submits to her husband. But sometimes one, or all, of those elements are missing, and we have a distorted view of marriage and "wifehood". So how do we learn it? Of course we read the Bible and see our instructions there, but, how do we put it into practice? What does respect look like...how do we actually show it? And submission, what is that funny word? Oh, what? You can't be serious! I remember in one of the women's Bible studies I took part in early on in our marriage (I was a new Christian). The subject of submission came up. It was a foreign concept (and word!) to me. As the ladies talked and laughed and gave examples of how they had to just be quiet and patient when their husbands made decisions they didn't agree with, I looked with shock from face to face, trying to determine if they were serious. Of course, there it was in the Bible, so I had to learn a new thing that almost seemed laughable to me at first! But what if you could have a mentor, or several mentors, showing you examples and encouraging you to be a good, pleasing wife to your husband? If you do not/did not have one physically present with you, my review this month for the Gabby Moms will direct you to some wonderful resources. The Marriage: To Have and to Hold Bundle from Eternal Encouragement is something I would recommend to wives or wives-to-be, both young and old. If you are completely new to the roles of a Christian wife, or even if you are a long-married woman, I am pretty sure you will find many things that could be beneficial to you in this package. I thoroughly enjoyed this resource and felt so blessed to be able to review it for the Gabby Moms. There are so many good things about this bundle, it would be hard to name them all. Lorrie cuts straight to the heart of our role as wives, and how we can be a benefit to our husbands instead of a detriment. We can only change ourselves and not our husbands, and this bundle is a wonderful learning experience to do just that. Lorrie has been married for 25 years and draws on her own experiences as well as the experiences of other women with lasting marriages, and of course the Word of God. If you are feeling like you want to give up on your marriage because the difficulties seem insurmountable, you will want to get this bundle. If you have years of experience but want to learn how to be a better wife, you will want to get this bundle. God loves marriage, and we should honor ours and be the best wives we can be, regardless of our husbands actions (or in-actions). 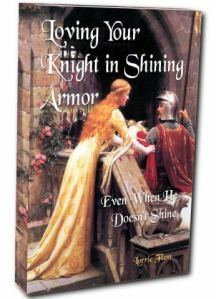 If you have difficulties in your marriage, you will especially love the ebook from the bundle called Loving Your Knight in Shining Armor Even When He Doesn't Shine. This ebook will show you how to strengthen your marriage, even if your husband is not working on his part. The bundle includes audios, ebooks, ebooklets, and even a couple of TEACH magazine back issues that have great marriage helps. You have the option of purchasing either the digital or shipped version of the bundle. 2001 Summer Issue TEACH Magazine "Loving Your Husband"
2009 Spring Issue TEACH Magazine "Marriages Made Marvelous"
All of these amazing products are worth over $100 altogether. However you can purchase the bundle for only $39.97 (electronic version) or $49.97 (shipped version). I am sure you will enjoy it just as I did! * I received this product for free in exchange for my honest review from Gabby Moms and Eternal Encouragement Magazine. All opinions expressed are solely my own. Here's to blessing your marriages! "if we could change our husbands, we wouldn't have any problems" haha yes, so we think, huh? Good thing we can work on ourselves. Thanks for stopping by! Very, very interesting, Mrs. Q. How many years have you been married (just curious)? Hello, Shelly. We've been married 10 years. It's a sad fact that many marriages flounder because of not understanding God's principles and design for a godly wedded life. These look like some good christian resources. I'm so glad to hear that you were in a Bible study with women who took submission seriously. I've been in Bible studies where they all joked and laughed about the entire concept. Submission was God's idea in the first place, and I know my marriage has been blessed when I comply. I'm still learning, too! It's true, Trish. Yes, the bundle is truly good, and so helpful. Julieanne--it does not surprise me that you experienced Bible studies like that! Our thinking has been so twisted in this century it can be very hard to get out of that state of mind.